Create your own imaginary prehistoric beasts by turning over the flaps of this clever book. This interactive board book lets you mix and match the heads, bodies, and tails of ten real prehistoric animals--like the saber-tooth tiger, woolly mammoth, and Macrauchenia--in order to create almost a thousand different imaginary ones. The flaps include interesting facts about each animal part, so you can learn how your Flip-o-storic creature would behave. There's also a handy chart that shows the actual size of the ten real animals that make up the "ingredients" of your Flip-o-storic, and gives the meaning and pronunciation of their names. 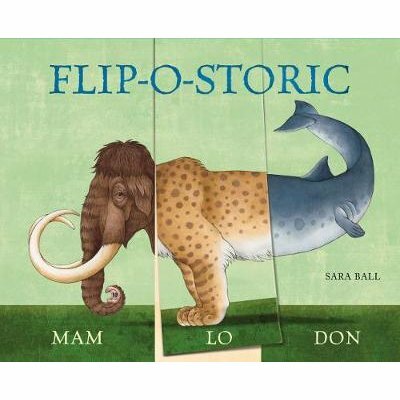 Flip-o-storic--which follows the incredible popularity of Sara Ball's recently released dinosaur book, Flip-o-saurus--will captivate the imagination of anyone fascinated by these impressive and now extinct species. With its fun concept, beautiful artwork, and high production values, this book will make the perfect gift for any kid who loves the prehistoric.